Lovepop employees enjoyed lunch provided by Alchemista. “No gas station sandwiches here,” reads the website career section of a Cambridge software company. 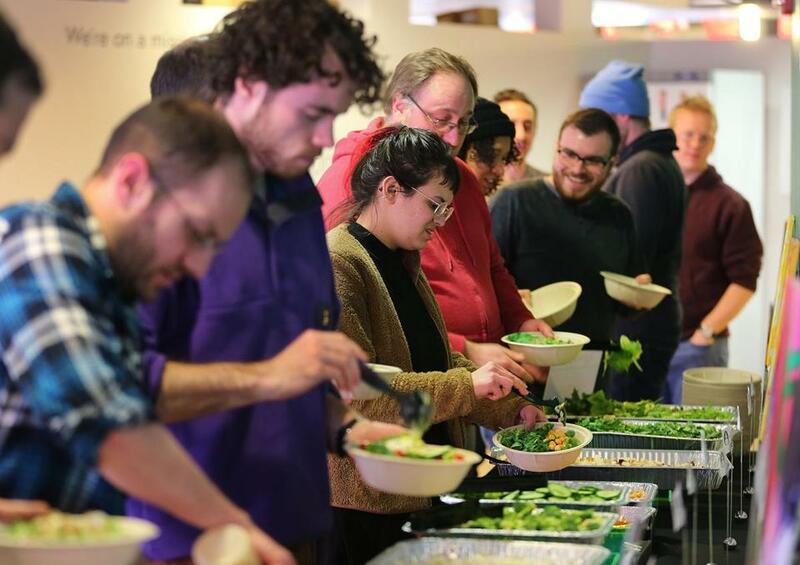 Promising workers free lunches every workday, the company joins with other tech companies and startups in the Boston and Cambridge areas that aim to sweeten employee benefit packages. Those perks, added to many firms proffering bagels and doughnuts to entice workers into early meetings, sandwiches for midday departmental meetings, and in some settings, beer, wine and kombucha on tap, mean eating free at work has become expected in parts of the corporate landscape. But at what cost? Is free food making us fat? Last summer, Stephen Onufrak, an epidemiologist for the Centers for Disease Control and Prevention and a member of its Healthy Food Environment team, presented a study on workplace food at the American Nutrition Society meeting in Boston. The CDC study of 5,222 employees looked at food from cafeterias and vending machines, finding that it was heavy on calories and light on nutrition. But Onufrak, speaking recently from the CDC in Atlanta, said the most surprising finding of the study was that “70 percent of the calories consumed” were at no cost to the employees. Most large-scale studies of food had been done in schools or other institutional settings, and this was part of the CDC effort to combat the obesity epidemic. Although the study was aimed at promoting better nutrition in cafeterias and vending machines, “I was still surprised at 70 percent” of the food consumed was reported as free, he says. Free food can be a “big problem,” says Andi Freedman, licensed independent clinical social worker. The tendency for some people is to think “if it’s free, it doesn’t count,” says Freedman, who counsels through her company, Mind Over Food. Also free food is difficult to refuse if coworkers are eating it and one fears being signaled out or feels deprived of what others are having, says the Beverly-based practitioner who coaches using cognitive behavioral therapy. Meanwhile, food delivery systems for businesses are rapidly changing in an era where many firms lease working space and company cafeterias are becoming rare. One such link is Alchemista, which provides food from 75 restaurants to clients ranging from Lovepop Cards to Draftkings. CEO and founder Christine Marcus says that the tech, pharmacy, and startup companies of today are competing with Google and Facebook for employees, “but without the Google budget.” Alchemista, based in Boston with a Washington, D.C., branch, connects companies with “amazing food,” very curated and carefully managed and handled, she says, providing 30,000 meals a month, 85 percent of them in Greater Boston. The emphasis in the family-style catered meals, she says, is to make the employees happy and to foster employee bonding through sharing food. But quality fare and healthy options are also priorities of Alchemista and its clients. “Food as a perk has to be done well,” she says. Who orders that platter of cookies for the weekly staff meeting? If your employer hasn’t embraced healthier food options yet, take matters into your own hands. Garrett Harker, an owner of Eastern Standard, says that the relationship with Alchemista is part of the recognition that “people are using our restaurant differently.” Extending the restaurant world into a corporate setting makes financial sense, he says. The goal is to provide the same quality and experience to an employee in an office setting that might be had at Eastern Standard or sister restaurant Branch Line, with seasonal foods, good products, and carefully sourced proteins. Healthy eating is a priority, Harker says. “I want to eat healthy during the day,” he explains, citing choices for office workers such as wood-grilled vegetables, mixed salad Nicoise, and rotisserie chicken. He’s also committed to making sure the food arrives at the companies (restaurants in the Alchemista group must transport their own food) in the “vision that myself and my chef had for it.” The association with Alchemista has just begun, and he’s projecting his restaurants will be active in the venture two to three days a week. The idea of free lunches may come from the beginnings of startup companies, often just a few young employees with young owners. Katherine Boardman, vice president of people operations for Litmus, a 12-year-old e-mail marketing company based in Cambridge, says when the company started, the two owners would take orders and go out and get lunches themselves for the employees. Now, she says, those in the Cambridge office order from menus that range from Zaftig’s in Brookline to Asian or Italian; the food is delivered by Seamless, a restaurant food delivery company. The company has 140 employees, some onsite and some working remotely, with offices in Cambridge, San Mateo, Calif., and in the United Kingdom. There are also healthy snacks available free — yogurt, fresh fruit, raisins — as well as traditional chips and other items — in the break room. 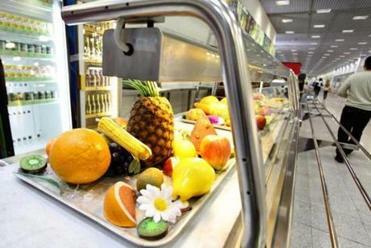 Beyond employees themselves choosing to eat well, can companies help to foster good eating practices? Kate Sweeney, administrative dietician for Boston College who also has a private practice, thinks that companies could help employees find a balance in eating. “Lunch at work is very stressful” for those who have eating disorders, she says. Sometimes the menus will fluctuate from healthy one day to pizza the next instead of striving for balance. She suggests an anonymous survey to find out how people feel about the food offered in the workplace since choices are often determined by the more vocal, leaving the less vocal stressed but silent. And she adds: “If someone knows every day there’s a free meal, they don’t really have a choice,” and can feel trapped. Offering nutrition or cooking classes might be a way for companies to help employees with eating choices, and consulting a dietician could be really helpful, she says. Alison Arnett can be reached at alison.arnett@gmail.com.